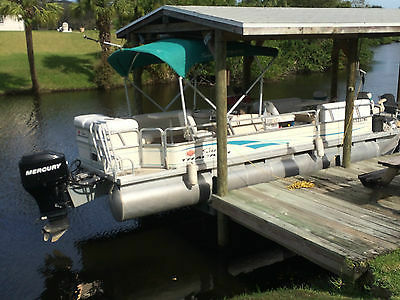 SELLING MY 2006 SUNTRACKER TRITOON ( 3 PONTOONS ) PONTOON BOAT - 24 FT COASTAL EDITION SEATS 13 PEOPLE WITH 3 FISHING SEATS, 4 LOUNGES AND CAPTAINS SEAT PLUS REAR SUNDECK.. HAS 2 EAT ON TABLES W/ DRINK HOLDERS, HAS A SINK AND FRESH AND WASTE WATER HOLDING TANKS, VINYL FLOOR COVERING, BAR-B-QUE GRILL AND STAND .. PRIVATE ENCLOSURE WITH PORT -A-POTTI , BATTERY STORAGE COMPARTMENT WITH ON - OFF, SWITCH, * ONLY NEGATIVE IS THAT I RE-DID ALL THE SEATS LAST YEAR WITH EXTRA HEAVY DUTY MARINE MATERIAL AND IT IS NOT PROFESSIOANLLY DONE, BUT IT WILL LAST YOU THE NEXT 10 YEARS OR MORE... LOOKS GOOD , NOT GREAT.. BOAT HAS FULL GUAGES, CUSTOM STAINLESS CHROME STEERING WHEEL, AM-FM W SPEAKERS.. ( THE RADIO IS ON THE FRITZ..) SOME LIFE JACKETS, ANCHOR, DOCKING LIGHTS, ICE CHEST COMPARTMENT, AND COMPLETE WITH 8' X 8' TEAL BIMINI TOP AND I HAVE AN EXTRA NEW BIMINI CANVAS BURGUNDY TOP FOR IT ( OPT.$125.). BOARDING LADDER AND FENDERS THIS IS A GREAT BOAT TO GO OUT WITH FRIENDS , PARTY ON THE WATER, SWIM FROM, ( REAR SWIM PLATFORM AND FRONT S/S BOARDING LADDER, PLUS REAR GATE AND SIDE AND FRONT GATES.. BAR-B -Q ON AND DOCK.. LADIES LOVE THE PRIVATE BATHROOM AND TOILET.. LIKE I SAID BOAT HOLDS 13 PEOPLE.. ENGINE IS A 2006 MERCURY FOUR STROKE 90 HP. WITH POWER TILT, ELECTRIC START AND IT IS THE FUEL INJECTED MODEL , ( NO CARBS TO GUM UP ON YOU ) RUNS GREAT .. 12 GALLON BUILT-IN FUEL TANK.. WITH WATER SEPERATOR. 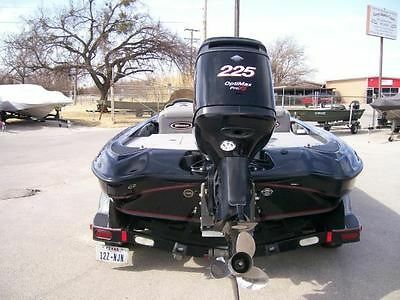 INCLUDES: TANDEM AXEL 27 FT TRITOON TRAILER IN GREAT COND. FRONT BOARDING STEPS AND MUCH MORE.. -- *** PRICE: $15,995...... / CLOSE AND REASONABLE BEST CASH OFFER CONSIDERED--- NO TRADES OF ANY KIND.... 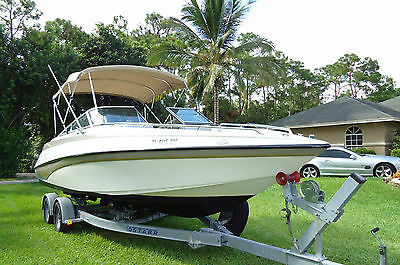 THANKS YOU MUST PICK UP BOAT W/ TRAILER IN PALM BAY FLORIDA ZIP 32905 , ONE HOUR FROM ORLANDO FL. AND 20 MILES BELOW COCOCA BEACH OFF RT #95 SOUTH AT EXIT 176.. NO FINANCING AND NO TRADES, BELOW IS THE NADA BOOX VALUES : 2006 Tracker Marine NADA BOOK VALUES BASE PRICE -- Low Retail --- Average Retail Base Price $13,120--- $7,430 ---$8,490 Options: Bimini Top $235 $265 Stereo - AM/FM/CD player w/4 speakers $275 $310 Docking Lights $300 $340 Outbd. 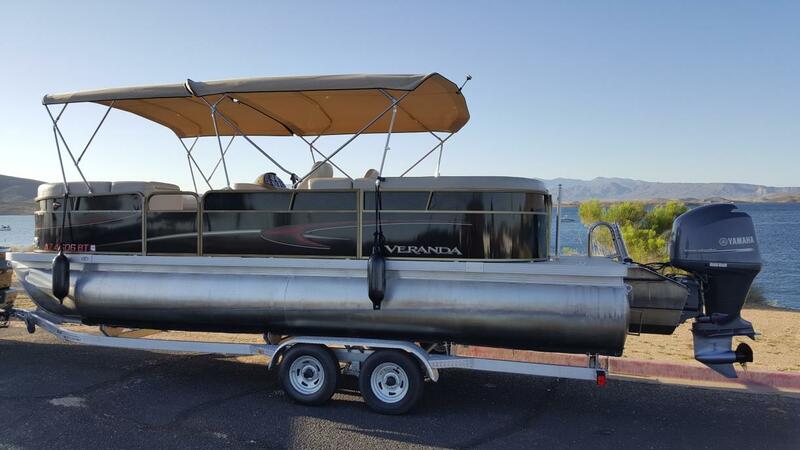 Power Tilt/Trim (50-100 HP) $265 $300 Porta Potti $120 $135 Swim Step w/Fold Down Ladder $205 $235 Hydraulic Steering System with Tilt Wheel $455 $515 Triple Pontoon - 24' Boat $2,105 $2,255 Outboard Engine: 80 - 99 HP --- $2,460--- $2,460 Trailer: 2006 Tandem 27 Feet $2,420 $2,720 Trailer Options: (change) Aluminum Step Plates (4) $130 $150 Spare Tire and Carrier $160 $180 TOTAL NADA VALUE PRICE: BASE $13,120--- LOW $16,560 ----AVERAGE $18,355 ---- MY PRICE IS $15,995. 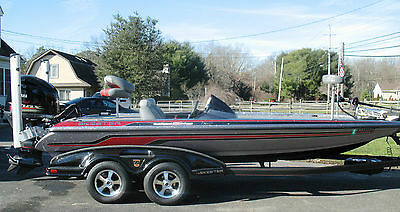 2013 Skeeter FX21 Bass Fishing Boat & 250VMax SHO 4-Stroke Yamaha Only 35 Hours!